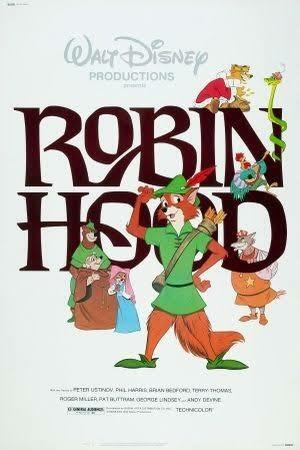 Last night I watched Disney’s Robin Hood with my kids for the first time. I was reminded exactly why the movie was a childhood favorite. As a boy, I wanted to be that sly fox armed with bow and arrows, nerves of steel, courage and valor, and a heart for the people. Even as an adult, there’s something hilarious about a portly hen speaking with a Scottish burr and a childish Prince John crying out for his momma. I found myself wrestling with the ethics of robbing the rich to give the poor, whether it was advocating socialism, and what kind of hero my children were being encouraged to emulate. What I realized–whether intended by Disney or not–was that the plot of Robin Hood closely mirrored the basic elements of salvation history, and it provided some very tangible illustrations for traditionally cerebral concepts. In my memory, Robin Hood was principally an expert marksman. Who can forget the scene where Robin’s arrow cleaves the tricksy Sheriff’s arrow in two as it hits the bullseye? However, the narrative actually hangs on Robin’s skill as a master of disguise. Robin’s ability to loot his enemies and evade arrest lies in his clever costumes and affected accents. Over the course of the movie, he disguises himself as a gypsy, a gangly stork, a blind beggar (twice), and a buzzard. Robin’s disguises prevent his enemies from identifying the outlaw. However, there is one group of people who see Robin for who he really is: the peasantry. When Robin is with the poor people of Nottingham, he drops the disguise and they immediately recognize him as their true hero and only hope. When Jesus was clothed in humanity, his true identity was not revealed to all men. Jesus told his disciples: “To you it has been given to know the secrets of the kingdom of God, but for others they are in parables, so that ‘seeing they may not see, and hearing they may not understand'” (Luke 8:10). The religious leaders who oppressed the people could not see the truth about Jesus. But when he was with his people, his identity was no longer hidden–they saw their Hero. The Bible presents sinners as debtors to the law, kept in captivity and unable to pay back what we owe. Paul writes that God “[cancelled] the record of debt that stood against us with its legal demands. This he set aside, nailing it to the cross” (Colossians 2:14). It can be difficult to explain this concept of debt to our children. However, Robin Hood presents a clear picture of debtor’s prison. Prince John continually raises taxes on the peasantry of Nottingham, amassing piles of gold in his castle until finally he collects their every last penny. When they have nothing left, he locks the entire town in prison. 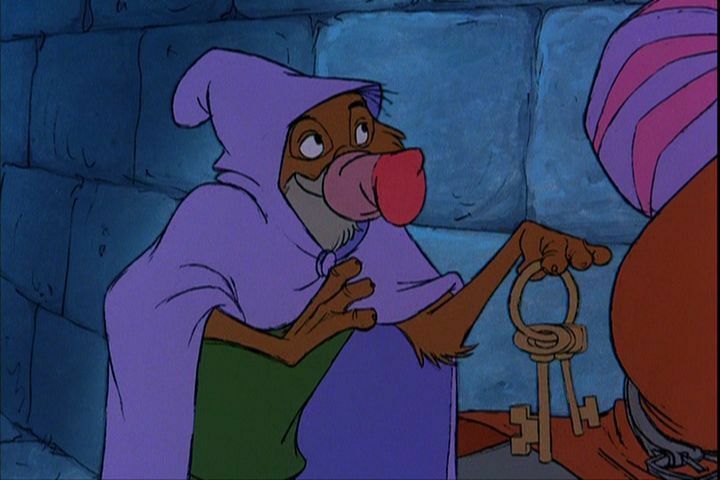 In a dramatic jailbreak, Robin Hood sets all of the people free from their debts to Prince John. What’s more, he loots the Prince’s bedroom, distributing the riches to the poor. This picture illustrates what Paul means when he says, “God sent forth his Son…born under the law, to redeem those who were under the law” (Galatians 4:4-5). Like Prince John, the law’s demands put us in debtor’s prison. Jesus came to set us free from a debt we could not pay. Also, like Robin Hood he looted Prince John’s castle. He fulfilled the whole law, winning its blessings and bestowing them upon his people. Prince John’s serpentine sidekick Sir Hiss awakes to find the bedroom empty and Robin Hood escaping from the balcony. In a comical scene, he drags John–bed and all–out the window after Robin. 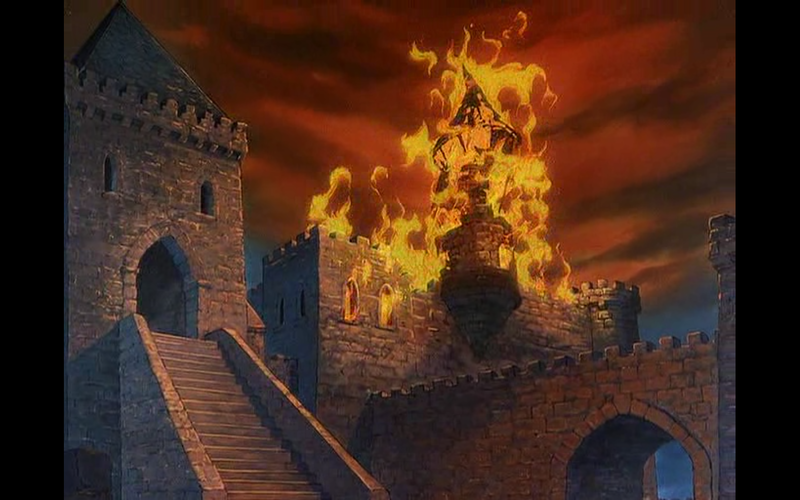 Realizing he has been robbed blind, in mindless rage John sets fire to his own castle as his guards seek to destroy the stealthy invader. 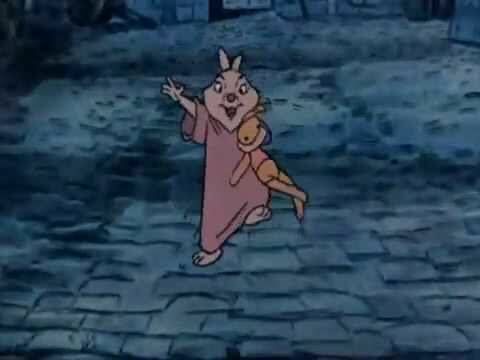 As the people safely escape across the drawbridge, Robin Hood hears the cry of a young bunny: “Momma, Momma, wait for me!” Robin hurriedly returns to rescue the little one but gets locked inside the burning castle. Little John and the rest of the people of Nottingham look on from afar as their hero climbs the highest spire and plummets to his death in the watery moat below. The people of Nottingham could not be rescued without the ultimate sacrifice of their hero. However, as tears pour down their face, they notice a reed moving through the waters. As it approaches the bank, Robin Hood splashes from the water in a grand victory over a watery grave! Robin Hood’s plunge gives us a great opportunity to talk with our kids about the connection between water baptism and the way water symbolizes death and the grave. Like Robin, Christ tasted death for all who repent and believe. Wedding and Return to the Garden. 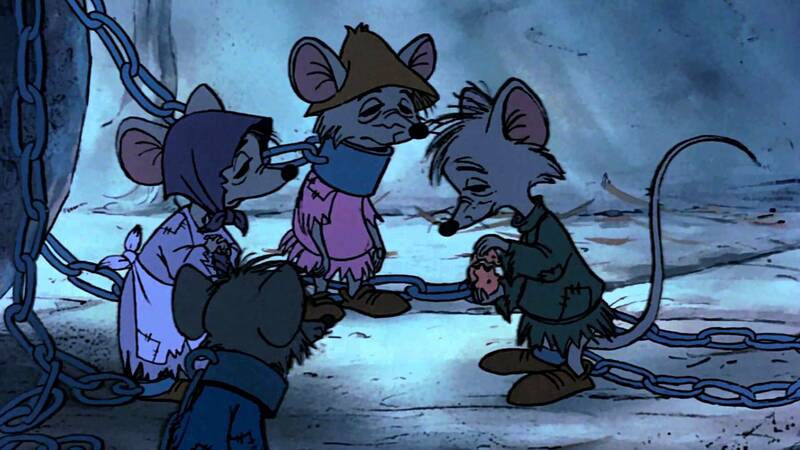 Like any Disney movie worth its salt, Robin Hood ends with a wedding. The true king, King Richard, returns to England, the people of Nottingham receive back their homes, and the whole town erupts with hoorays as Robin Hood and his bride ride off into the forest. 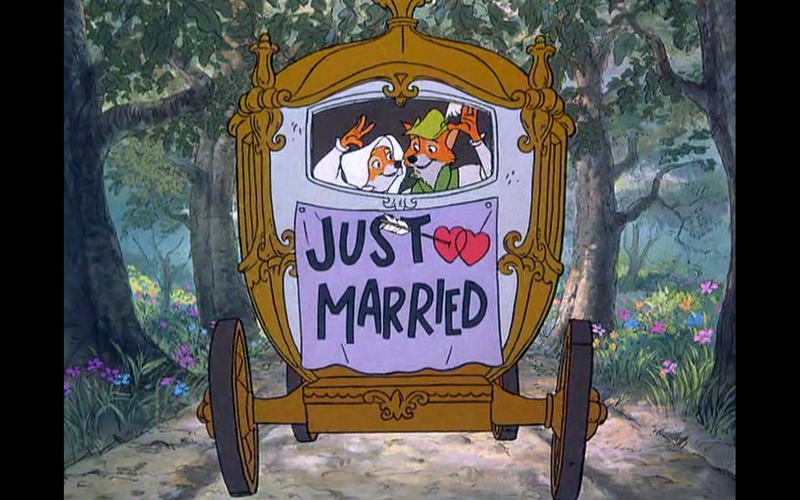 One of the few great things about Disney classics is the way it conditions our kids to expect a wedding at the happy ending. The greatest joy comes when the hero rescues and marries his betrothed beauty. Robin Hood gives us yet another opportunity to talk with our kids about Christ’s return for his church. One day, he will set all things to right and he will take his church back to Sherwood Forest–the Garden where he will wipe away our every tear and make all things new.